AIM is redefining social networking – add a location to your status, post to your favorite social networks or chat directly with your Facebook friends. Get updates from Facebook, MySpace, Twitter, YouTube, Foursquare and more – all in one big Lifestream. •	Built from the ground up for the Apple iPad. •	Chat directly with your Facebook friends. •	Add your location to your status message. •	Select a background theme to express your mood or personality. •	Post your photos to your Lifestream (up to 40 at one time) or comment on your Buddy’s photo or status. •	Get updates from your favorite social networks in one easy to navigate window. •	Send and receive messages over Wi-Fi, EDGE, or 3G networks*. •	Connect to anyone on the AIM network worldwide, whether they’re on Facebook, AOL®, AIM, ICQ®, .Mac® or MobileMe. •	Configure multiple usernames and switch between identities any time. •	You can send IMs to anyone who has a cell phone that supports text messaging* – even from a Wi-Fi-only iPad. It’s easy to get started. Just sign in using your existing AOL, AIM, .Mac or MobileMe name, or register for a free screen name right from your device. 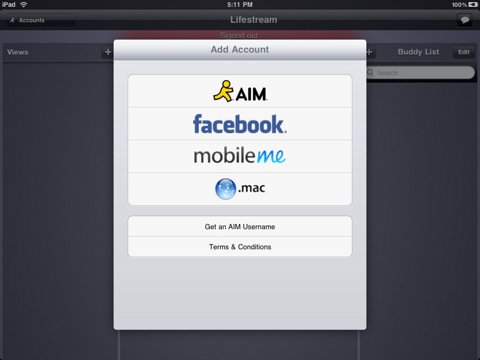 Let us know what you think about AIM with Lifestream and hear from our team at http://iblog.aol.com/. * iPad Wi-Fi + 3G supports EDGE and 3G; AOL does not charge a fee to send text messages using AIM. Text messages are treated the same as normal IM messages and are included as part of your device’s data plan. SMS features are not available in all countries.